Jay Bennett was an acclaimed musician, guitarist, singer, songwriter and producer most often recognized for his work in the twice Grammy-nominated band Wilco. He has played with the band for 7 year and after leaving Wilco in 2001 he has recorded 5 solo albums. 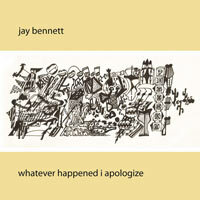 Bennett released “Whatever Happened I Apologize” only on rockproper.com as a free Creative Commons album in November 2008. He died in his sleep on May 24th, 2009. Bennett was a founding member of Titanic Love Affair. The band recorded three albums in the 1990s: Titanic Love Affair (1991), No Charisma (1992), and Their Titanic Majesty’s Request (1996). From 1994 through 2001 Bennett was a member of Wilco. Conflicts between front man Jeff Tweedy and Bennett that would contribute to Bennett’s split with Wilco are visible in the Sam Jones film I Am Trying to Break Your Heart: A Film About Wilco. Although Bennett sought to act as both mixer and engineer for Yankee Hotel Foxtrot, Tweedy was unsure of Bennett’s abilities against those of producer Jim O’Rourke. Tweedy and Bennett frequently argued over whether the album should be accessible to a general listener, or attempt to cover new musical ground. Unbeknownst to Bennett, Tweedy invited O’Rourke to remix “I Am Trying to Break Your Heart”, and the results impressed the other band members — even Bennett. Tensions grew between Bennett and O’Rourke because Bennett wanted to play a more integral role regarding the mixing of the album. O’Rourke cut the contributions of other members on several of the songs; some songs, such as “Poor Places”, only featured the Loose Fur trio of Tweedy, O’Rourke and Wilco drummer Glenn Kotche. The album was completed in 2001, and Bennett was dismissed from the band immediately afterwards. After leaving Wilco, Bennett released five solo albums. The first, entitled The Palace at 4am (Undertow Music), was a collaboration with Champaign musician Edward Burch. 2004’s Bigger Than Blue was a more stripped-down set of personal songs. In the same year he released The Beloved Enemy, which saw Bennett exploring his personal turmoil in even more intimate detail. The Magnificent Defeat, was released in September, 2006. He released Whatever Happened I Apologize in November 2008 on rockproper.com. Bennett had been working on a sixth record, tentatively titled Kicking at the Perfumed Air. It is unclear whether that record will see release posthumously. Jay was an avid fan of Woody Guthrie. In addition to his popularity in Wilco and as a solo performer, Bennett was also a highly regarded and sought-after studio talent, having played on albums by Sheryl Crow, Allison Moorer, and Billy Joe Shaver, and produced Blues Traveler’s 2005 release, ¡Bastardos! On May 24, 2009 Bennett died unexpectedly in his sleep. Details of his death have yet to be revealed. At the time of his death, Bennett lived in Urbana, Illinois, where he spent most of his time writing songs and recording in his private studio, Pieholden Suites. Produced by Jay Walter Bennett. Written, arranged, and performed by Jay Bennett (except where noted). Recorded and mixed by Jay Bennett at Pieholden Suite Sound, Urbana, Il. Mastered, sequenced, and edited by Jonathan Pines, with Matt DeWine, and Jay Bennett, at Private Studios, Urbana, Il. Additional song selection and editing by Alex Moore. Background vocals on “I’ll Decorate My Love” by Edward Burch. “Wicked World” written by Daniel Johnston. All songs ©?2008 You Want a Piece of This Music (ASCAP), administered by Bug Music, except “Wicked World”, published by Primary Wave Music. Cover art by Jay Bennett. Fixed, thanks for letting us know.